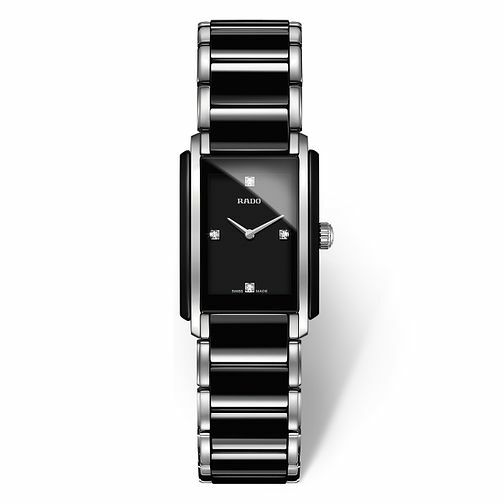 A stylish stainless steel and black ceramic bracelet watch from Rado. A rectangular black dial is set with 4 sparkling diamonds, adding a touch of sparkle for day to evening glamour. Rado produces design-led, innovative watches that are unique in the market. Rado ladies' stainless steel & black ceramic bracelet watch is rated 5.0 out of 5 by 1. Rated 5 out of 5 by Anonymous from Beautiful Beautiful watch. It is not flimsy and has quite a good weight to it. It does have an additional catch for ease of getting on and off so your not straining the links when trying to get it over your hand. My only gripe is that many stores didnt have it in stock so i had to buy it online. I am very pleased with it.